We will use this page to add articles and update news and events related to Ginkgo Grove Daoist Center. Check back often. When my friend Max asked me to write an article for her blog about knitting, I was flattered, but a little hesitant at first. I know almost nothing about knitting, quite honestly. I know a few people who knit, and another friend raises her own sheep and spins the wool into beautiful organically dyed yarns, but I have never knit myself, and it all seems rather esoteric and mysterious. But then, so (probably) does Daoism to someone unfamiliar with the term. So I put aside my doubts and agreed to write the article. You could ask, and rightfully so, what a priest from an ancient and obscure Chinese religion could possibly contribute to a subject that he admittedly knows next to nothing about. Hopefully, I can help you to see your art (and I do believe that it is an art and you are artists) in a fresh light. Perhaps this will help you to see a problem in a new way, or simply help you to gain a new appreciation of your knitting and yourself. First, I need to explain a couple of terms so that we are speaking the same language. Dao is the fundamental concept underlying Daoism. Simply put, “Dao” means “the way”, or “the path”. It can also mean “the method”. Everything we experience with our senses is the Dao. The entire universe is a manifestation of the Dao. Yin and Yang, which literally mean the dark and light sides of a mountain, are the female and male, negative and positive aspects of the Dao. This is graphically represented by the Yin/Yang symbol, or “Taiji” – the supreme ultimate. The symbol shows the universal dance of these aspects, constantly changing, constantly moving, each containing the seed of the other. Qi (pronounced “chee”) is the energy inherent in something. 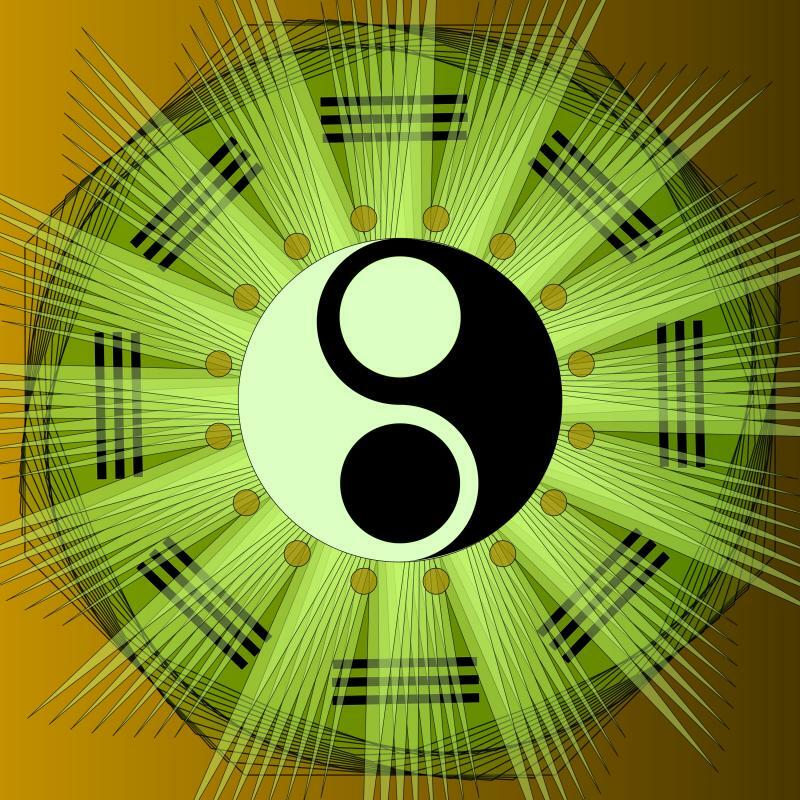 Everything has qi energy, either yin or yang, or some combination of both. How in the world does this relate to knitting? That’s a very good question. If we understand that Dao can also mean a “way”, or a “method” then we can certainly say that there is a Dao of knitting. As artists, you have an individual “way” or “method” of working and creating also. For the time being, I would ask you to spend time focusing on this method, your method, and not the final product. If you celebrate the process, and truly put yourself into it, the end product will naturally be an outgrowth of that. The next time you pick up needles and wool, consider them a little more closely. These are your tools and media, the same as a painter has brushes and paint. You create art that is not only beautiful, but practical as well! That is harmonious indeed. If pure beauty alone can be considered passive – or yin, then being able to wear the thing of beauty to stay warm could be considered active – or yang. See? Your art is already balanced and harmonious, without you having to do anything special! Don’t worry about the end result. Consider your needles. Are they wood, metal, plastic? All are valid, and have an energy specific to themselves. Once you start thinking about that, you can decide if that energy is what you want to bring to the piece that you are working on. Wood is considered yang, metal is yin. They would impart their inherent energies into your work. Even plastic, which is a product of the earth, has energy. Earth energy is yin and yang in balance, therefore plastic needles could be considered more or less neutral. Now to your wool. Is it natural fiber, or synthetic? Animal fibers (wool, silk) are generally considered yang, while those derived from plants (cotton, linen) would be yin. What color is it? Chinese color theory as it relates to qi is a whole school of thought unto itself! Certain colors are considered yin or yang, of course, but they also have an effect on certain organs and therefore our physical and mental health. Briefly, green affects the liver, red the heart, yellow the spleen, white the lungs, and black/dark blue the kidneys. Don’t be overwhelmed. You don’t even need to know all of this. The next time you start a project, trust your instincts. Don’t try too hard! This is Dao. There is a very important concept in Daoism called “wuwei” which means non-doing, or more appropriately “non-striving”. Pick needles that feel good in your hands. It doesn’t matter if they are finely crafted bamboo or wooden needles, or something inexpensive from a mega-store, as long as they are comfortable in your hands, and appropriate for the project. They will become an extension of your hands and your creativity will flow from your hands into the needles, and into the work. What energy the needles bring on their own is only in addition to what you bring. Pick yarn that you like the look and feel of. Note whether it is natural or synthetic, but that doesn’t matter if it makes you feel good working with it. That is the energy that will go into the project. Now for the process. Remember “wuwei”? Don’t stress about the project. Try not to worry about stitch counting. Is stress and worry the energy that you want to go into that baby blanket? If you are worrying about the color, stressing about the stitches, obsessing about getting it done on a deadline, I guarantee that is the energy that will flow from you into the work. Instead, trust in your own skills. Give yourself plenty of time and the right resources to finish the project. Then make it a meditation. Soon, you will find yourself in “the zone”. Your hands, confident in their skill, will free your mind from worrying about the details. But don’t let your mind wander aimlessly! Focus on putting the joy that you feel while knitting into the project. When you are in this state you become what Daoists call an “empty vessel”. An empty vessel is open, receptive, able to be filled with the Dao. Your actions will become effortless, you will achieve balance, “wuwei”. Your work will be a manifestation of the Dao; balanced, perfect, and beautiful. Altars are very personal things, and form the locus for one’s daily spiritual practice. It contains symbolic representations of deities or concepts held sacred to the adept. It also contains ritual implements to aid in paying homage to those deities or concepts. There are many articles on the Internet regarding Buddhist altars, but there are far fewer resources for Daoists. Here are some guidelines for setting up an altar specific to the practice of Quanzhen Daoism, its proper care, maintenance, and use. Throughout this article I will make reference to the altar in my shrine/meditation room. As indicated in the title, these are guidelines and they are meant to be just that, not dogmatic rules. First, a word about the actual altar itself. I use a small cherry wood end table, about one foot deep, two feet wide, and three feet high. It has a two shelves; an upper one designed with a slight angle for storing books, and a lower one which I use for storing candles and incense. I have draped over the top a silk brocade altar cloth, which helps keep incense ashes and candle wax off the table surface, and adds to its beauty. I got this table at a garage sale 25 years ago and have used it as an altar table ever since. Any similar sized table will serve nicely. Simple or fancy does not matter. Central to a shrine or altar is an image of the concept or deities one holds sacred. As Daoists, we obviously hold as sacred the concept of the Dao or Way. One can use an image of the taiji (yin/yang) or the taiji surrounded by the bagua. I use a hand painted verse from the Dao De Jing written in Chinese. The largest word on the scroll is Dao (道 ). Whatever image you use to represent the Dao, it should be placed in the highest place on the altar to indicate its primary importance. I hang mine on the wall behind my altar and slightly above it. Next, one should consider representations of The Three Pure Ones, or San Qing. These are often referred to as the “Daoist Trinity”. They are the Celestial Worthy of Primordial Beginning, the Celestial Worthy of Numinous Treasure, and the Celestial Worthy of the Way and Its Virtue (the deified Lao Tzu). They represent, among other things, jing, qi, and shen; past, present, future; heaven, earth, humans. The Celestial Worthy of Primordial Beginning should occupy the center of the group. The Celestial Worthy of Numinous Treasure should be placed on the right and Lao Tzu on the left. There are many pictures of the San Qing available in the public domain on the Internet. They can be printed out, put in frames, and placed towards the back of the altar, just below the image representing the Dao. Finally, one’s altar deities should also include a guardian. Typically, in Chinese shrines and temples that I have visited, the guardian deity was located to the left of the main shrine, so I have chosen to place a statue of Guan Yu on the far left of my altar. Many people mistakenly think that Guan Yu is the God of War, but this is incorrect. While it is true that he was a military general during the Three Kingdoms era in China, he protects those that show faithfulness and honor, not necessarily those going into battle. In Daoism he is held to be a guardian and protector against demons, and in Buddhism he is considered a bodhisattva and a protector of the dharma. There are many images of Guan Yu available commercially. Some show him on horseback, some seated and reading a scroll, and others standing with his sword, “Green Dragon Crescent Blade”, in his hand. If you choose the latter, make sure that the sword is in his right hand as some Tongs (Asian gangs) use an image of Guan Yu with the sword in his left hand. Another option for an altar guardian would be a representation of Zhong Kui. Zhong Kui was a student who was unjustly failed in the Imperial exams in ancient China because of his physical deformity and he killed himself out of shame. Later his spirit defeated the demons plaguing the Emperor and which were causing him severe headaches. Out of gratitude the Emperor granted Zhong Kui official status posthumously. Images of Zhong Kui often depict him with his foot on the throat of a subdued demon. It’s a good idea to have an image of Guan Yu or Zhong Kui, both very fierce looking, to ward off any potential negative energies looking to hitch a ride through your altar. An incense burner can be placed centrally and in front of the pictures of the Three Pure Ones. It should contain sand or ashes, enough to hold incense sticks placed in it for burning. The incense burner does not have to be fancy, although many are. Mine is just an earthenware tea cup made by an old friend. I usually burn three sticks at a time, twice a day at the morning and evening ceremonies. You should periodically sift the sand in it to remove burned out pieces of incense sticks. Allow your incense sticks to burn out naturally. Don’t extinguish them and reuse them later as this is considered disrespectful. Likewise if a stick of incense burns incompletely, don’t attempt to reuse it for the same reason. In front of the incense burner you may place three offering cups. These should contain (from left to right) water, rice, and tea. The water and tea I change daily, in the mornings. The tea is the first tea of the day. The rice I change every few days and feed the old to the birds rather than waste it. (Don’t worry, it’s a myth that rice will expand in birds’ stomachs and harm them.) The water represents yang energy, the tea is yin energy, and the rice represents the union of yang and yin nature. These cups can be special ones especially for this purpose that can be obtained at Asian markets, or small teacups. To the left and right of the offering cups are candles. I use votives as these tend to be less messy (no dripping wax) and safer (no tipping over). As for the candles themselves I try to use auspicious colors such as red. The candle on the right symbolizes the sun, and may be orange in color; the one on the left, symbolizing the moon, may be white. Make sure the candles are of a high quality so they burn cleanly. I light the candles before morning and evening ceremonies and meditation, and extinguish them directly afterward with a candle snuffer. You can use your finger also. Don’t blow them out. Not only is this considered disrespectful, but they may also smolder, smoke, and the wick will burn down making them harder to relight the next time. Under no circumstances should you let them burn completely down and gutter out. This supposedly leaves a portal open for demons to come through, but if you have a statue or picture of Guan Yu or Zhong Kui, you should be OK.
Those are the basics, but you can expand from there. I also have a small brass bell on the right of the altar that I ring 9 times (3 sets of 3) at the beginning and the end of the morning and evening ceremonies. The purity and clarity of the tone helps to purify the room. 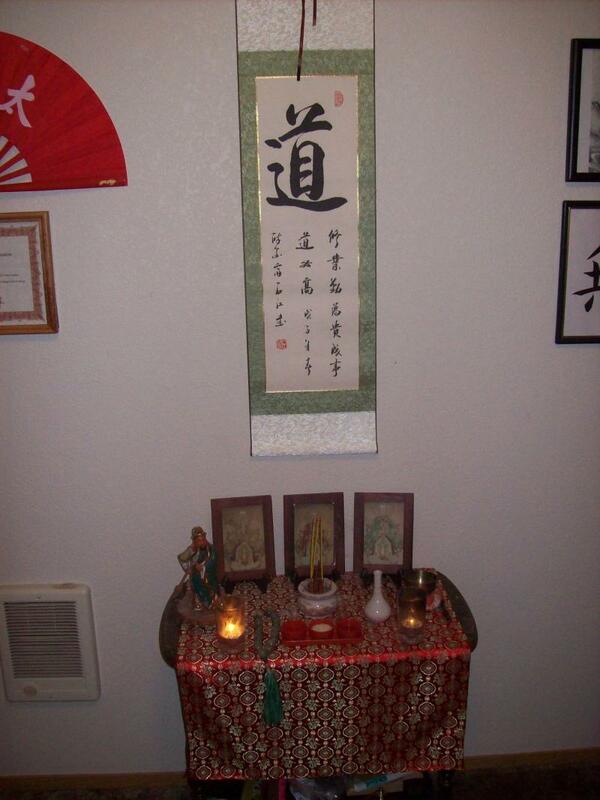 I also have my Daoist rosary on the altar to the left of the incense burner so that it is handy for me to say my mantra at the end of the ceremony (san qing jiao zu wu liang tian zun). I also often place seasonal flowers in a bowl of water or small vase on the altar wherever there is room. Don’t let the flower get wilted. It should be replaced daily with a fresh one. The same holds true for food offerings if you choose to use them. They should be fresh, changed often, and never left to spoil in front of the altar. Fresh seasonal fruits are best. Always keep the shrine room where the altar is placed clean and quiet. Remove your shoes before entering, and never recline in front of the altar with your feet pointing at it. Always be respectful and speak in calm tones in front of the altar. Don’t show the altar to anyone who would not be respectful of it. Don’t allow animals in front of the altar or in the shrine area. Remember that this is a place for you to connect with the divine Dao, the source of all that is. Copyright 2012 Ginkgo Grove Daoist Center. All rights reserved.